Indigenous, Migrant, Community Organizer, Activist with love and motivation to create social change in collaboration with inner-city youth. Born in Guerrero, Mexico, Reyna was raised by her grandparents who taught her to preserve the land and pass on her indigenous roots and practices. At the age of 6, Reyna migrated to the U.S. to reunite with her mother. With the support of her hard-working family, Reyna is the first generation to attend college and pursue a degrees in Latin American Studies, Liberal Arts, and Psychology. Growing up in the Mission, Reyna has lost many friends and loved ones from violence, health inequities, gang-related homicides, and separation due to deportations, and incarcerations. As a former at-risk young Latina in the Mission, she started working with the community at the age of 13. Reyna is currently an Immigrant Rights Community Organizer with the nonprofit Communities in Harmony Advocating for Learning and Kids (CHALK). 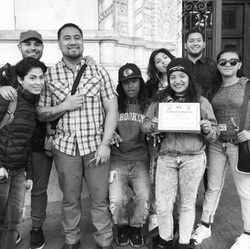 Based out of San Francisco, CHALK provides a range of youth services with a specific focus on transformative youth development and employment. CHALK’s employment programs place in-risk youth on the front lines as service providers for their peers. Youth are trained, supported, and gain essential job and life skills, all while positively contributing to the community. The Immigrant Rights Campaign focuses on providing undocumented youth with stipended internships and guides them through the process of learning how to do community organizing. This year Reyna will be launching a youth-led resource clinic called the Undocu Drop-In. The clinic recognizes the barriers that undocumented youth face and will provide them with services and support to enroll in higher education, apply for scholarships, and connect with organizations, lawyers, and institutions that can help them to accomplish their goals.